My name is Rina, I am 20 years old. 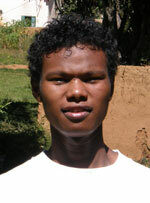 I am Andry’s cousin and I live with Andry and his family at Ivato. I started my job in Tourism by helping Andry for the hotels and internal flights reservations. When I finished my French and English study at Space Info Institute and when I got my driving license, I went with Andry on different tours especially to the West of Madagascar, down the Tsiribihina River and to the Tsingy de Bemaraha National Park. That is how he could share to me his guiding skill. Also, I discovered with Andry and Narcis the OLE in the middle of the gorge of the Manambolo River. This West of Madagascar is my favorite place and it is where I would like to guide you to share my experiences.